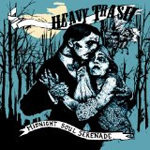 When I heard Spencer was bringing his oddball rockabilly band Heavy Trash to Pittsburgh in April, I imagined that, at 45, Spencer and his equally middle-aged band would scratch out only an hour or so of solid album material. At best. I was happy to be proven wrong when three hours later I stood, dizzy from the best, most charming, rambling, batshit set I’d ever seen by any band. It amazes me that any person on the planet has as much energy as Spencer, who sweats onstage night after night in brocade suits, putting on a one-man psycho-preacher revival for hours without stopping. During the swooning closer, soul-stirring ballad “In My Heart,” Spencer’s band looped and looped as he broke off repeatedly into long-winded declarations on the nature of love and lust. Always in character, full of hilarious swagger and ridiculous ideas, Spencer strung us along for what must’ve been at least twenty minutes, possibly thirty, rushing into the crowd, falling down, getting back up, and reminding us that rock ’n roll is not dead, that it’s right here in this crazy, committed, unpredictable performance, that for twenty-plus years he’s been blowing the lid off, that he puts other rock stars to shame. Thankfully, he doesn’t show any signs of slowing down.